Roll right through the rainy months. The Skyline Softshell is constructed from a 3 layer waterproof softshell Artex fabric that's lightly insulated for colder conditions. Due to its highly elastic properties, Artex doesn't restrict movement as you ride, making the Skyline an ideal choice for any type of riding, from challenging winter training miles to the rigors of the daily commute. Showers Pass has added three rear pockets and zippered chest pocket to store gear, snacks and other cargo. A full length front zipper and underarm zippers provide convenient ventilation. The drop down tail provides backside coverage when needed and reflective accents increase your visibility on the road. The Skyline Softshell is available in Chili Pepper Red or Black. Great product, fit and sales price. I love this jacket. I've worn it on several cold, fall ride, when temps have dipped into the 30s and wind blowing at 20 mph, and always stayed warm. When I warm up, instead of shedding it, the venting system is wonderful, and enables me to adjust without stopping the bike. Love the fit, style and design. Gorgeous rain jacket. Zipper is a bit of a pain, however. difficult to engage and zip up. I have bought several jackets with the promise of breathable. This is the first jacket that works well. I use it to commute to work for temps from 10 - 40 F, using proper layer, it works well. Showers Pass is a local company and are definitely attuned to the Pacific Northwest climate. I actually live near Skyline Drive and this jacket is exactly what's needed most mornings from November to March. Excellent styling, very comfortable, intelligently ventilated, with copious storage compartments leaves you wanting for nothing. Bonus Chili Red is LOUD and very observable. I have explored the gamut of cold/wet weather cycling outerware and this jacket is at the top. I bought this jacket because it fit me better than the Elite 2.0 and 2.1 jackets which are too big in the body and cut under the arms to high. According to Showers Pass, this jacket only has a water proof rating of 3 out of 5. Same with the breathe-ability. It kept me warm in 50 degree weather with a baselayer. I was also in a steady rain and I felt damp, but that might have been from sweat. I don't know for sure. SP says it will keep you mostly dry in most conditions which is how I felt. Had I known the ratings before, I don't think I would have bought it. I notice a very slight draft through the front zipper. Also, the rear pockets do not close, sans a tiny zippered one. This makes no sense to me on a rain jacket where water can get in. If you carry a cell phone, you'll have to baggy it in wet weather. All in all, it's a good coat, but if you want something truly water-proof, you'll have to spend much more if you go with Showers Pass. Nice jacket for the price, but cut weird. 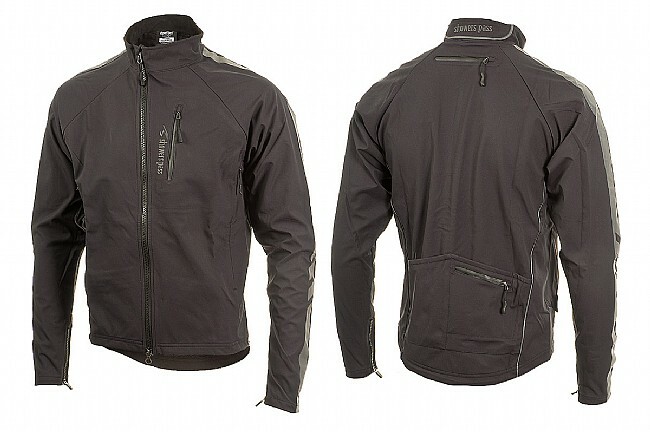 The jacket is a good value and hard to beat considering all of the features it has. However, it is cut quite weird. I am 6'0 and 165lbs bought the medium. The jacket is too short, the back does drop down a little but not nearly enough for on the bike. Sleeves are long enough, but very snug in the forearms and super baggy in the upper arms. Chest is also far too baggy, but the waist is very snug. The pit zips only go up to your armpit and are on your side, so they don't really take in any air when opened. They either need to be moved forward or up under the arms, when they are opened is just causes the chest to billow out. The jacket is warm for how light it is and seems to be fairly waterproof. It may be windproof as well but it is hard to tell because the jacket is so thin it feels very cold for the first couple of miles. The only reason I am still somewhat happy with the jacket is the price. Perhaps it will fit you better. At 5'10 and 155 lbs the medium fits me perfectly - not bulky and no flapping. Jacket construction is top notch with nice features such as pit and upper back zips. Sleeve zips also makes it easya to put on. Styling also a big plus with reflective arm bands. Out on the road it completely blocks the wind. I have ridden with it in temps ranging from 12-30 degr f. It can handle 30 degr with a base layer and a light weight fleece but at 12the degr it required multiple layers making it too snug. So bottom line is perfect for cold (25 and above) but not too cold unless maybe going up s size to allow layering. I can imagine that the only jacket better than this would be one that cost 3-4 x's as much. I just came in from a 2 hour ride in 15fht. Totally warm with layers underneath. I have also worn it in serious rain and wind. Warm and dry. Great venting and made tough.